Your First Visit to a Synagogue. So you’re interested in attending a synagogue. You might be a bit nervous. You’re most probably curious. Hopefully, you’re also excited and eager, and you want to learn. These are all good emotions to have. When you have a goal in sight, it makes the journey easier. Remember, you are going to see new things, different things. It may take time until you learn the ropes. If you can, try and find a beginners’ service. NJOP, the National Jewish Outreach Program, has beginners’ services in many areas. If you can’t find a beginners’ service, don’t worry about it. Visit your synagogue anyway. Once you get the hang of it, you’ll be able to follow along with no problem. It is always easier to enter a synagogue if you’re not alone. If you know someone who attends a synagogue, get in touch with them and ask if you can go with them, have them show you the ropes, help you keep up with the congregation, introduce you to people before or after the services, that sort of thing. The very best thing would be to stay as a guest at the home of a Sabbath observer for an entire Sabbath, and get the feel of how it feels to live in a Jewish community. Living in a Jewish community is very important in being Jewish. It is possible to be fully observant even if you are isolated from a Jewish community, but it is much more difficult. It is all the more difficult for those new to and unfamiliar with Judaism, because they are still learning, and they need people from whom to learn. But for now, let’s focus on your visit to the synagogue. Before you go, read the article «How to Dress and Act at an Orthodox-Jewish Festive Occasion.» Most of what is written there also applies to visiting a synagogue. As you enter the synagogue, be aware, above all, that the people in the synagogue, the congregation, are for the most part normal human beings, just like you. As a human being, you will understandably feel self-conscious. That’s normal. And they’re normal, too. That means that, just like you, they are curious. Sometimes they are unintentionally rude. People are always curious about newcomers. When you see someone new, you also stare. They mean no harm; they usually don’t even mean to be rude. Some of them are wondering who you are. Some of them are wondering if you have a place to eat the Sabbath meals. Some of them are wondering if they can help you, and some of them are wishing they had the guts to go over to the new stranger and introduce themselves and offer their help. (And some of them are just plain rude.) For the most part, they really don’t mean to make you feel unwelcome. Anyone who does can usually be dismissed as the meshugenah of the bunch. Remember, there’s at least one in every crowd, sometimes more than one. Don’t let them get to you. They don’t own the place, and you’re Jewish (or will be, if you’re planning to convert) just like them. If you are visiting during the High Holy Days, I have heard that there are some synagogues that charge for entering. Personally, I would pray elsewhere. A synagogue should be open to every Jew who wishes to come pray. If you don’t have the option of visiting another synagogue, see if you can come to some agreement with the usher, or whatever they call the attendant there. There will be separate seating for the genders. This is not meant as an insult or a slight. If you’d like to read more about this, check out my wife’s article: «The View From Within.» If the seating is not separate, then the synagogue is not being run according to Jewish Law. Each synagogue has a cantor (or whatever that synagogue chooses to call him), who leads the prayers. For the most part, he acts as a vocal «bookmark.» When he says (or sings) something, the congregation knows what they should be saying. Sometimes the cantor simply says a few words, and everyone says the next psalm or paean; sometimes the cantor has a long recitation with periodic responses from the congregation. We’ll get to those responses later, Hashem willing. On occasion there are response recitations, where the cantor says one verse, and the congregation either repeats it, or says another in response. But these are infrequent. By now, you have already at least glanced through your prayer book, and are somewhat familiar with its layout. You know that there are different prayers and different sections. Some parts are said standing up, and some sitting down. If you have a good prayer book (what we call in Hebrew a siddur), like the Artscroll Prayer Book, it will give instructions for most of these situations. One reminder: If you visit the synagogue during the Sabbath, do not bring your prayer book. It is forbidden to carry things in the street on the Sabbath. Sometimes it can be permitted in certain areas, if there is something called an eruv. You may, however, bring the prayer book to the synagogue before the Sabbath starts, and take it away after the Sabbath ends. These days, though, the average synagogue has at least a few English prayerbooks (if someone thought to donate any). So on your way to the synagogue you have the chance to pray — that there’s at least one English prayerbook left for you to use! If they do not have any at all, consider donating some to the synagogue. Most synagogues operate at a financial loss, and cannot afford to accomodate everyone, unfortunately. To return to the Service. For the most part, the congregation will wait for the cantor to prompt them to move on to the next piece. If you can follow what’s going on, try to say the same thing everyone else is saying. Though the prayers are in Hebrew, it’s okay to say them quietly in English, if that works better for you. If you can’t follow what’s going on, don’t worry. Don’t even be surprised. The first few times you attend you will not catch on immediately. In some synagogues they announce what page they are currently saying, but not all synagogues do that. It really does not matter if you are not keeping up. Really. That’s not the most important thing. There are very few things that you have to say together with the congregation, and you’ll pick them up in time. Your prayer book probably mentions them. The most common response expected from the congregation is Amain, accent on the second syllable (ah-MAIN). Just say it when everyone else does. In a perfect world, you are supposed to know what the cantor is saying when you say Amain, but until you get used to what’s going on the important thing is to get used to the responses. Okay, here’s a wrinkle. Sometimes there is selective congregational participation. For example, if someone is Heaven forbid in mourning for a relative, and they’re saying kaddish. So, instead of the cantor reciting kaddish, that mourner says kaddish, and everyone else answers amain. There are longer responses that will show up here and there during the prayers, and even one in the middle of kaddish, but for your first time let it go. You’ll pick it up in time. Sometimes the Rabbi will give a sermon in the middle of the prayers. In the more advanced synagogues there may be study classes after some of the prayers, or at nighttimes. It’s more than worthwhile to attend these classes and lectures: it’s vital for everyone’s growth in Judaism to study Torah. If you are attending synagogue on a Saturday morning or noon, better known as Shabbat day (i.e., Sabbath daytime), there might be a kiddush (not to be confused with kaddish). Kiddush is the blessing over wine that we say every Sabbath and Holiday. Sometimes people donate to the synagogue wine, cake, and possibly other food for the congregation and visitors to enjoy after the morning prayers. If so, don’t begin to eat right away. Wait until the cantor, Rabbi, or other designated person recites the kiddush over wine. Answer amain, wait until he begins to drink the wine, and then you can begin eating. Sometimes a person will make a kiddush specifically for invited guests and relatives. There are any number of reasons someone might do this. It’s nothing to be offended about. If someone announces a kiddush, it usually means it’s open for everyone, but pay close attention to the announcement anyway, just in case. Some synagogues have a kiddush every week, arranged by the members. Sometimes the kiddush is donated by an individual. When a person has a festive occasion, such as the birth of a daughter (for a boy we make a bris, so there is usually no kiddush on the Sabbath), or the marriage of a child, he often makes a kiddush at the synagogue or at his home. A kiddush is also given around the anniversary of a loved one’s passing to the next world (called a yartzeit, in Yiddish). The offering of free food to the public is an act that makes people feel good, so this is counted as a merit for the soul of the deceased. The custom is to offer wine (or liquor) and cake to the congregation at the synagogue, in addition to any other acts of charity one does for the sake of the deceased. During the kiddush is a great time to mingle. Most especially, get to know the Rabbi. If you are there alone, don’t worry about being introduced. In all likelihood, the Rabbi is used to having strangers introduce themselves. If he were shy, he probably wouldn’t have become a Rabbi. Tell the Rabbi your situation. Ask him if he can help get you invited to Sabbath meals, or to experience an entire Sabbath at the home of an observant Jew. Believe me, that is the key to understanding what Judaism is all about. If you would like to find a place to stay and/or eat for a Sabbath, try these links. To find beginners’ services in your area, visit NJOP: the National Jewish Outreach Program. To choose a good siddur (prayerbook) at a reputable Judaica outlet, visit: Tiferes Stam & Judaica. I recommend the Artscroll Siddur. My wife’s article about separate seating in the synagogue: The View From Within. This entry was posted in Learning About Judaism on 20/12/2017 by admin. Books that I feel are at least semi-advanced, and probably not for beginners, I have placed in the “Stage Two” section. Within each stage, it doesn’t really matter what order you read them in, but most Rabbis will probably suggest you study about prayer first. The books in these lists are both of practical Jewish law and of Jewish thought and philosophy. Both Jewish Law and Jewish Thought are of vital importance in Judaism. In Judaism, we believe that one must both believe as a Jew, and act as a Jew. One alone cannot be more than a springboard to attaining the other, and only both can complete a person. Most of the books in these lists are required reading by most Rabbis for conversion applicants. Those that aren’t will help you in any case. First Steps in Hebrew Prayer, by Dr. Danny Ben-Gigi — learning how to daven and read prayer book Hebrew. I have seen samples of this book on the internet, and I was impressed. It looks great for beginners, and it has some very vital content. To Pray As a Jew, by Rabbi Chaim Donin — A guide for the beginner to the prayer book and the synagogue service. Maimonides’ Principles: The Fundamentals of the Jewish Faith, by Rabbi Aryeh Kaplan. The title speaks for itself. Artscroll Tanach Series, by Rabbi Meir Zlotowitz. It is an excellent gateway to the Bible, Prophets and Writings for the lay person. It is a multi-volume translation, with commentary and an introduction for a conceptual understanding. I’m not sure that a conversion Rabbi will insist on any particular translation of the Chumash, he may accept any good translation as long as it’s from a reliable Rabbinical source. This is my G-d, by Herman Wouk. A well-written, basic review of Jewish religion and life by a renowned contemporary writer. It explains Orthodox Judaism, what differentiates it from other forms of Judaism, talks about major Jewish holidays (including ones that non-Jews don’t generally know about, like Shavuot, Sukkot, etc), gives a brief history of Israel, an explanation of what the Torah is, the Written Law and the Oral Law, and some interesting information about the Talmud. All in all, a good summary of modern Jewish observance. incredibly comprehensive and invaluable guide to the facts about keeping kosher. It even has a very useful guide to reliable kosher certifications and their logos and symbols. I am told that it is required reading by many conversion Rabbis. If it is not, I nevertheless suggest you buy this book and at the very least read whatever parts of it interest you. The 39 Avoth Melacha of Shabbath, by Rabbi Baruch Chait — Actually, this is a children’s book. However, it is an excellent way for anyone to learn about the modern-day practical applications of the basics of the Laws of the Jewish Sabbath. We owned a copy, and I learned many things from it. Strongly recommended, and also required by many converting Rabbis. Becoming a Jew, by Maurice Lamm, (JD Publishers). I have not read this one myself, but the author is known to be reliable. For practical purposes, I suggest studying the Kitzur Shulchan Aruch (Abridged Code of Jewish Law). A handy version is the linear translation, the Metsudah Kitzur Shulchan Aruch (published by Israel Book Shop). This work will give you a lot of basic information you need to know about day-to-day Jewish Law. It will not give you encyclopedic or vast knowledge, and you’ll still have questions to ask, but it will give you a little bit of everything you need to know to live a Jewish life. It is a pretty handy “how-to” book on Judaism, and not just for beginners either. (However, remember that no study of the practice of Judaism is ever complete without first-hand experience. If You Were G-d, Rabbi Aryeh Kaplan. Contains three works. First, a novel understanding of G-d by putting yourself in His role. Second, a work on immortality and the soul. Third, an essay called “A World of Love” that deals with the purpose of creation. To be a Jew, by Rabbi Chaim Donin — A guide to Jewish observance in contemporary life. Calendar and the Holidays. It has a wealth of Jewish information, and is extremely useful. It is also an easy read. Many Rabbis insist on including this work, and will test you for that knowledge. I also recommend it very strongly. For the married, or for those seeking marriage, The Jewish Way in Love and Marriage, by Rabbi Maurice Lamm. This book is a popular authoritative presentation of Jewish teaching on love and marriage in light of the traditions and laws of the Bible. In that vein, A Hedge of Roses by Rabbi Norman Lamm. This book presents, in brief form, the psychology and philosophy of the laws of Jewish family purity, as well as valuable insights into marriage and married life. Artscroll Siddur, by Rabbi Nosson Sherman. Includes translation, comprehensive commentary and clear instruction for the beginner. With special sections at the end of the Siddur that discuss laws. Alternatively, you can use The Metsudah Siddur, by Rabbi Avrohom Davis. A linear Siddur with English translation and anthology of the classic commentaries. This might also be useful if you know a little Hebrew and are trying to advance your knowledge in the language. With a linear translation, it is sometimes easier to figure out which English word goes with which Hebrew word. very usable alongside whatever Chumash you use. Many people recommend it be studied alongside the next selection, The Midrash Says. Ethics from Sinai, by Rabbi Irving M. Bunim. Commentaries on a section of the Talmud that discusses some of the ethical teachings and wisdom of Judaism. For men, Tefillin: G-d, Man, Tefillin, by Rabbi Aryeh Kaplan. Insights to meaning behind Tefilin and practical aspects of the mitzvah. Also for men, Tzizith: A Thread of Light, by Rabbi Aryeh Kaplan. The author delves deeply into the mystery of the commandment of Tzizith to reveal the link between Tzizith and the ability of man to overcome his faults and reach towards G-d.
As you advance in your studies with a Rabbi, he will assign you reading material according to your abilities and your level of knowledge. It is advisable not to tackle any book without your Rabbi’s advice. There are many books out there from unreliable sources. The chart below was created by NJOP: the National Jewish Outreach Program. They have a great program of FREE courses in Hebrew, everywhere in the USA and Canada. After your first lesson, (just 1 & 1/2 hours), you could be reading Hebrew! The National Jewish Outreach Program has a program of FREE courses on Hebrew, everywhere in the USA and Canada. The program entails five sessions, each one and a half hours long, one session a week, and it’s absolutely free. Call 1-800-44-HEBRE(W). The site has online Hebrew resources as well. An Aleph-Bet chart created by NJOP, as part of the book associated with their course. 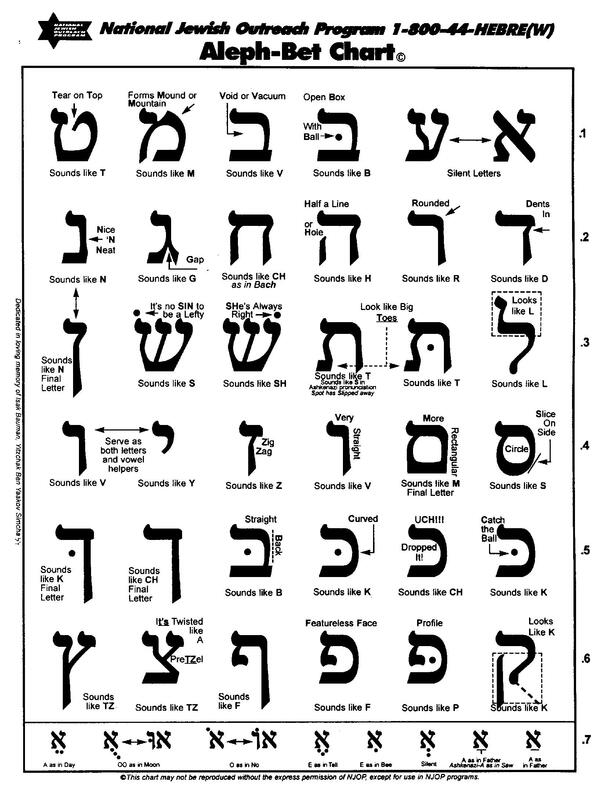 charts that include the Hebrew letters in three formats: block, script, and Rashi. The charts also have the numeric value of each letter. Learn Hebrew is a free, on-line, educational resource to learn Hebrew words. The flash site incorporates 46 topics, along with over 1,700 Hebrew words and phrases. Each Hebrew word is presented as an image with nikud [vowels]. When you click on a word or phrase you can hear it spoken. This is a very impressive and big site. And it’s not only for English speakers either. The menus, transliterations and translations are in five languages: English, French, Russian, Spanish and Dutch. Learn Hebrew with Pictures and Audio is a free, online, educational resource to learn Hebrew words in a fun way. The site has 425 words and photographs ranging from fruit and vegetables to household items. Each Hebrew word is presented as an image with nikud [vowels]. There is an English transliteration and translation for each word and the Hebrew audio track provides you with the correct pronunciation of each word. This is an amazing page with many links to Hebrew pages, emails, and online classes in Hebrew, Hebrew letter charts, a discussion forum, and much more. Some are free, and some are programs for sale that you can order. A site FULL of amusing and entertaining games for children, through which they can learn simply Hebrew, as well as other Jewish educational matters. They also have an online Hebrew Keyboard Tutor. This website gives a free online lesson on the basics of reading and understanding Hebrew, especially Biblical Hebrew. It’s actually an intro for a longer course in Hebrew, for which they charge $27.00 a month. But what I’ve seen of the free intro class it seems to be well-done, by reliable people. A great multimedia site for kids to play and learn about Judaism. These people have really gone to great lengths to make a good page. Davka is a leading Jewish software companies. They have some very good products, many of them educational. A major distributor of Judaic Software. Learn Torah, Hebrew, Talmud, play games, use word processors, learn about Israel, Yad Vashem (Holocaust Studies), Bible Codes, and more. Did you ever wish you had your own personal trainer to help you with your spiritual growth? Now there is a program, called Partners in Torah, which will provide you with such a trainer, free of charge! Designed for Jewish adults who are interested in exploring their Jewish heritage, Partners in Torah will match you with a handpicked teacher with whom you can explore any area of Jewish thought that piques your interest. Together you’ll discover those eternal truths that give our lives a sense of purpose and greater meaning. You’ll study with your partner for up to one hour each week at a mutually convenient time, either in person or over the phone, absolutely free of charge. They also provide phone cards to accommodate long-distance learning. Join any time you like and continue for as long as you choose. Prior Jewish education or knowledge of Hebrew is not required. The topics are endless and your individual course of study is up to you. To join Partners In Torah, visit the Partners In Torah website.